This file documents the 1.20 release of the motion analysis tool called bisce (July 2000). The bisce package (pr. "bee-sheh") is an image tracking tool developed by Alessandro Rubini (rubini@linux.it) and others. It has been sponsored by the Dept. of Human Physiology, Univ. of Pavia, Italy. Bisce is a motion analysis tool, originally used to track filaments, whence the name (bisce is the Italian name for snakes). It is implemented as a few separate building blocks and stacking on a few external packages: the pacco image processing library and the pxc frame grabber driver (for the ImageNation pxc200 frame grabber). While the package doesn't really depend on the specific device driver being used, I designed the acquisition engine of the pxc driver with an eye towards bisce. It should be possible, though, to set up other acquisition engines to produce a bisce-friendly data set. The package is sponsored by Istituto di Fisiologia Umana in Pavia, Italy, and has been written mainly by Alessandro Rubini, with parts by Massimiliano Pini and Marco Pantaleoni, and is released as free software according to the GNU GPL. A kind of simplified (and reduced) file browser/manager, used as main program that invokes other programs. This is usually the only tool that must be invoked directly (using the command-line or a window-manager menu entry). The Debian-packaged version of the program automatically adds an entry in the window manager menu for s-manager, under the Apps/Lab section. The acquisition engine. It acquires a sequence of images from the camera and saves them to disk. The tool is not described here as it belongs to the pxc package. See the pxc manual for details. The tools is invoked by s-manager when an acquisition is requested. A simple tool to view acquired data. It is invoked by s-manager or by s-results (below). This program is the core of the package; it is a user interface to control actual analysis of data: it gives visual feedback of the ongoing analysis and internally drives s-follow for actual tracking of image frames. The computational engine to track cells across the acquired frames. It is invoked by s-trace and produces output data for s-results. A tool to manage results produced by s-follow. It uses internally s-newresults, a simple filtering script not described here as it is unimportant, both on the practical and on the theoretical level. S-manager is a simple file-manager designed to be the entry point for image tracking. If starts in the current directory, unless the environment variable SMANAGER_DATA exists and is a valid directory (in this case the program starts from that directory). The window is made up of a top bar, a list of files (with scrollbar), and two rows of buttons. The top bar in s-manager shows the program's version and how much free disk space is available in the current directory. The disk space information (and the file listing) is automatically updated every two seconds. If you click on the version string, a copy of tkinfo is spawned to show this very documentation. The file list is not comprehensive, it only shows directories, compressed files and bisce-related items. Those items are physical directories on disk, but their content is laid out in a known way and they can be used by other parts of the package (s-viewer and s-results). Double-clicking on list items invokes one of the actions listed below, the specific action depends on the actual item being double-clicked. The acquire button can be used to fire the pxc_xgrab program, to acquire a new image flow in the current directory. If one such program is already running, its window is raised and no new program is fired. The button is only effective if an acquisition directory or an mpeg file is selected in the file list. If this is the case, the program either fires an instance of s-viewer or fires mpeg_play. The same action is invoked by double-clicking on an experiment directory or an mpeg file. If a copy of s-viewer is already running, its contents will be updated to show the selected acquisition (no second copy of the program is fired). The button fires an instance of the s-trace program. Any already running s-trace is first asked to terminate, so only one analysis can be active at any time. The button only works when an acquisition directory is selected. Run the s-results application on a result directory (the button only works when a result directory is selected). Any already running s-results is first asked to terminate, so only one such program can be active at any time. The action is also invoked by double-clicking on a file representing acquisition results. Run the mpeg_encode application on an acquisition (or black-and-white) directory to create a sequence file in mpeg format. Mpeg is supported in order to copy acquisition data to other operating systems where mpeg is supported and can be viewed easier than several pgm files. Note that while the mpeg file is much smaller than original acquisition data (10-50 times smaller) I can't currently use it as input, so the format is considered output-only. Compress, or uncompress, the selected directory or experiment. If the name of the selected file ends in .tar.gz, then the file is replaced by its uncompressed form. Otherwise, the file is compressed and replaced with a .tar.gz one. Uncompressing can also be accomplished by double-clicking on a compressed file. Create a new directory. The button invokes a simple dialog box so the user can enter the name of the new directory to be created. Remove the selected directory or file. The button has no effect if no item is selected. After deletion is confirmed, it can still fail is the selected directory is not empty. If this is the case and s-manager doesn't show any file inside the directory, you must resort to external tools to remove the directory (since s-manager doesn't show non-bisce-related files, a directory may look empty even if it is not; the program won't take the responsibility of deleting files it doesn't know about. Rename the selected item using a dialog box to ask a new name to the user. If the new name corresponds to an existing directory, the file is moved to the new directory, keeping the same name as before. If the selected file is a compressed one, the program refuses to rename it (but you can still move it to another directory), because its contents are usually called with the same name as the archive, and renaming the archive would break that association. The command copies the results file (created by s-results to the floppy disk. The file on the floppy will be called like the selected results directory. The button has no effect if no results directory is selected. The role of s-viewer is that of showing a sequence of images, usually the results of an acquisition performed by pxc_xgrab. The window is made up of a top bar, the current image, a row of buttons and a scale showing the position of the current image in the sequence. The top bar in s-viewer shows the program's version and the name of the image sequence being displayed. If you click on the version string, a copy of tkinfo is spawned to show this very documentation. The image window is a full-size copy of the current image frame. The buttons are used to move within the image sequence. Each button can be either clicked with the mouse or invoked by pressing the associated key. The keys chosen to act on the buttons are those in the middle row of the keyboard: a, s, d, f, g, h, j. The button rewinds the current image sequence. If the program is playing the sequence, it won't stop playing but the current frame will jump to the first one. Play backwards. The program delays 200ms between one frame and the next one. Stop playing. The button is associated to the f key, which is easy to find on the keyboard because of its marker (the key, like j, is not flat). Play forward. The program delays 200ms between one frame and the next one. Play forward at fastest speed. The button is used frequently, and it is associated to the j key, which is easy to find on the keyboard because of its marker (the key, like f, is not flat). By acting with the mouse on the horizontal scale, the user can also browse the sequence at will. The s-trace program is the graphic front-end to the actual tracking activity (which is partly performed by the graphic program itself, and partly by the s-follow tool. The window is made up of a top bar, two views of the current frame, a slider showing the current position within the sequence, and a few controls for configurable parameters. The top bar in s-trace shows the program's version and the name of the image sequence being displayed. If you click on the version string, a copy of tkinfo is spawned to show this very documentation. The program performs two operations on each image (before passing data down to s-follow): thresholding and cell isolation. The two views of the current frame are the original (acquired) image and a processed image, either the thresholded one or the output image (after cell isolation). The control knobs are used to select the threshold value (used in the threshold pass), the minimum size of a cell (used to discard invalid light spots in the isolation phase) and the maximum distance (in pixels) that a cell is expected to move between consecutive frames (this parameter is passed to s-follow. Acting on the first two knobs affects the images being displayed, and by using the horizontal slider you can check the effect of parameter setting throughout the acquired sequence. By pressing the "Analyze" button, actual analysis is fired. The algorithm used to track cell movement has been split in several passes. The first step is thresholding the input image, in order to reduce data to a bitmap (a black and white image). The threshold level is an integer number in the range 50-250 and is assigned by the user interface. Next, the thresholded image is scanned in order to identify white areas. Each individual blob accepted or rejected according to the number of pixels is encloses. If the blob is smaller than the selected minimum it is discarded. Selection of the minimum cell size is done in the user interface (s-trace); the user can immediately see the effects of this thresholding and adapt the minimum size to the specific acquisition data. The "output image" that results from these steps is saved in a "black and white" directory; the image shows the thresholded input image as well as the bounding box and the center of white areas that are big enough. The "black and white" directory is called like the acquisition directory, with a trailing .bw appended (for example, if the acquisition directory is called "cells-jan25.001" the black and white sequence will be called "cells-jan25.001.bw". What is used in tracking image movement from one frame to the next is the bounding box of each white area, defined by the smallest and biggest X and Y coordinates of pixels in the area. The list of all the areas detected in each frame is passed as input to s-follow, which is in charge of the actual tracking. When the s-follow program, it is arranged to save all output data in a directory called like the acquisition directory, with a trailing ".res" added to the name (in the above example, the results will live in "cells-jan25.001.res"). The files in the results directory can then be used by s-results. The exact operations performed by s-follow and the format of the output files are described in its own documentation. The s-follow program is a command-line drive tool to filter image data from stdin to stdout. It is usually called by s-trace in order to perform actual image tracking, but it might also be used as a stand-alone tool. The description assumes the program is invoked by s-trace. Input data for the program is a list of rectangular regions associated to each frame; output data is a list of paths. Any time a new frame has been completely read, the program scans the list of active paths (i.e., paths that include areas in the last frame, that are therefore likely to continue into the current frame) trying to find a match for each of them. For each active path, the program finds the area in the new frame that matches best the expected position of the cell in the path (the expected position is the sum of last position and the last calculated speed). Each area in the new frame can only be associated to one path (if the best match for a given path is already taken, the best-but-one will be considered). The best match must in any case follow within a user-defined maximum (expressed in pixels), which is passed as a command-line argument to s-follow, and is usually specified as "Max Step" within s-trace. If a match is found, the length of the cell is calculated. Since s-follow uses only the bounding-box of the cell, the length is calculated as the length of the intersection of the bounding-box and a line oriented like the cell being tracked (e.g., a cell with a square bounding-box of 10x10 pixels moving towards N-E will have a calculated length of 14.4 pixels.). Image areas in the new frame that cannot be matched to existing paths are recorded in the list of active paths, because the can be the starting point of a new path. When every frame has been processed, everything that s-follow identified as a path is printed to stdout, and usually gets saved to a file called res.tmp, in the results directory. The file is then sorted and save to a file called results, which is what is considered the relevant information. The value represents the average speed of the cell, as measured from the staring point to the ending point of the path. So, this is the speed if the cell moves straight; usually however the cell will bend during motion thus invalidating this figure. The value is expressed in um/sec, according to the acquisition parameters. The number (still expressed in um/sec) represents the average speed of the cell, calculated on a three-steps-at-a-time basis. In other words, if a cell is tracked from frame 0 to frame 6, the program calculated the speed from position 0 to position 3, from 1 to 4, from 2 to 5 and from 3 to 6. In this way high-frequency noise should be reduced, while bending movement is taken in account. Average length of cell, expressed in micrometers (according to the acquisition parameters). The number of frames where the cell appears, minus 1. If a cell has been tracked in 10 frames, it means there are 9 "steps" in its path. This number is used by s-results to discard any path that is shorter than a user-defined minimum. This information is saved so s-results can show (using s-viewer) the cell associated to each set of figures. The s-follow program can optionally produce much more verbose information. 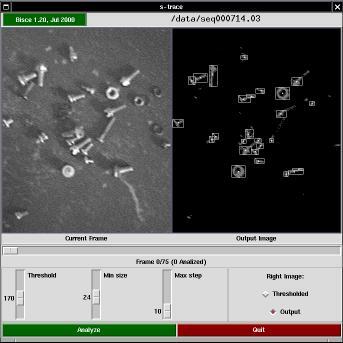 While this feature has been initially implementing for debugging/verification purposes, later implementations of s-results use all of the available information (in particular, they need to know the exact position of the cell in each frame). Therefore, the "temporary" debug file is now a mandatory source of information, and s-trace always calls s-follow with extra-verbose options. This output file is called <dirname>.tmp, where <dirname> is the name of the results directory (for example, test-run.023 will have a results-directory called test-run.023.res and the verbose file will be called test-run.023.res.tmp within that same directory. Note that, by virtue of this "blessing" of a temporary file as real data file, a results directory cannot be renamed without requiring to re-run the analysis. This is definitely a bug, but not very high priority. s-follow reads input information from stdin, a line at a time. Each input frame is represented as a frame indicator (a line made up of a single integer number) and zero or more region descriptors (lines made up of four integer numbers: X and Y of the center, width and height of the region). An empty line is used to separate each frame from the next one. The fields are, in order: speed-if-straight, average-speed, length-of-cell, number-of-steps, first-frame, first-x, first-y. The "temporary" results file, is almost-free-format for historical reasons, although nowadays s-results is forced to parse it. The reader who want to know about this format is urged to take a look at one such files, as they are pretty self-explanatory. The s-results program is a user interface meant to help checking the results of an image tracking session. The tool performs two tasks: it draws diagrams and it allows the user to discard individual paths (redrawing the diagrams accordingly). The top bar in the main window of s-trace shows the program's version and the name of the results directory being displayed. If you click on the version string, a copy of tkinfo is spawned to show this very documentation. The window's main part consists of three histograms sharing the same X axis. The abscissa represents cell speed (in micrometers per second) and the ordinate represents the number of cells that travel at that speed, the average length of those cells (expressed as micrometers) and the average number of frames that constitute the paths represented by that column. Each histogram is drawn into a grid of 10x4 cells, and the actual values written on the grid are automatically generated to fall on even values. At the bottom of the window there are two control tools: an horizontal slider that allows discarding paths if they are too short and a grid of buttons to change the number of columns that make up the histogram. By acting on the slider, the user can discard all the cells whose path is shorter than the specified value. The histograms are automatically redrawn whenever the slider is moved. Please note that the scaling on the Y axis can change as the histogram changes, because the program recalculates the optimum Y scaling each time the histogram is redrawn. X scaling, on the other hand, is not modified and is common to all histograms. It may happen that the right part of the histograms looks empty, but this only happens when there are short-path items that would be displayed there when the user selects a smaller path threshold. Using the grid of buttons, the user can change the number of columns that are drawn in the histogram windows. The optimal number varies according to the number of cells that are present in the individual acquisition, as well as on the horizontal scaling that is chosen by the program. The height of each histogram bar (expressed in micrometers/second) is always displayed in the top bar as well. When the mouse pointer is moved over the histogram, the program highlights the bar where the mouse is sitting and prints detailed information about X and Y values of that bar. Such information is printed to the bottom-left of each histogram. 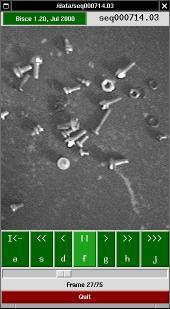 In a typical experiment, automatic image tracking may consider good some cells or path that are not good enough. To this aim, the user of s-results is allowed to remove individual items from the data set used to draw the diagrams. When the user clicks on one of the histogram bars (in any of the three histograms), a selector window is drawn on the screen in order to allow individual selection of cells/paths. The selector window is a tool that can be used to enable/disable use of individual paths in histogram creation. The window represents the acquired area enlarged by 2 or by 4 (default is 2). An "enlarge" button can be used to go to 4X visualization, and a "reduce" button can be used to go back to 2X visualization. Scrollbars are drawn whenever the window is smaller than the acquisition area (the window is always smaller than the screen to avoid problems in the user interface). The window includes drawings associated to each path that the s-trace and s-follow found and that histogram creation associated to the "current" histogram column (i.e., the one being clicked to open the selector window). Each path is represented as a black line; each cell position during the path is identified by a gray spot; the "head" of the path is identified by a blue square and the tail is identified by a dark-red spot. To the left of the acquisition area, there are one or more columns of check-buttons. Each button is associated to one of the paths, and its label represents the first and last frame where the path has been tracked. For example, a label of "22-48" means that the corresponding path started at frame number 22 and ended at frame number 48. The first frame of each sequence is numbered as frame zero. When the user drags the mouse over either a check-button or a path, both the check-button and the path are highlighted, so you can easily associate each check-button to its path. Whenever a check-button is de-selected, the corresponding path is removed from the active data-set, whenever a check-button is selected, the corresponding path is considered part of the the active data-set. When the "Ok" button is pressed, the selector disappears from the screen and the histograms are redrawn according to the new data-set. To avoid wasting system resources, no redrawing is performed if the data-set has not been changed. In order to ease selection of valid/invalid paths, the selector window operates in strict coordination with s-viewer. Whenever the mouse is dragged over either a path or a check-button, s-viewer is fired (or just notified, if it is already running). If s-viewer is already running, but it is displaying a different acquisition, it will re-load the acquisition data where s-results is working. If s-viewer is displaying the gray-scale version associated to the current experiment, then it won't switch to the input images. When the mouse is over a check-button or a path in the selector window and s-viewer is displaying one of the frames that build the current path, is-viewer will display a red ring around the center of the cell whose path is under the mouse pointer. If s-viewer is playing the acquired sequence, you'll be able to identify the path by looking at the red ring. 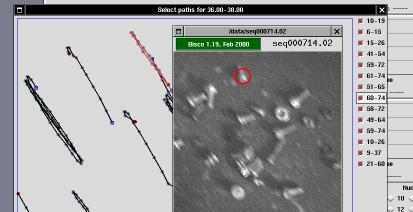 In order to allow easier tracking of paths, the current version of s-results can also drive s-viewer forwards and backwards in the frame-set. Whenever the mouse pointer is over a check-button, the user can use the s-viewer control keys (a, s, d, f, g, h, j) in the same way as they work on s-viewer itself, the only difference being in the behaviour associated to the a key. Whereas a would rewind the film when used in s-viewer, the same command issued by s-results tells s-viewer to jump to the first frame where the current path appears. Unfortunately, I've not (yet) been able to associate keyboard commands to the paths. Such commands only work when the mouse pointer is over one of the check-buttons, and not when the pointer is over one path. In order to accomplish its task, s-results builds some data files in the results directory. This document won't go into the details of such intermediate data files, but I think it's worth stating their role. While not all of these file are created by s-results, this is a description of the contents of a fully-populated results directory. Acquisition parameters. The file is created by pxc_grab in the acquisition directory and gets copied over to preserve acquisition information. It is used to know calibration information and the acquisition speed (need to calculate cell speed). The file is the exact output of s-follow. Same as above, but sorted according to the length of path. Debugging file from s-follow; now used to perform real work. A file derived from the debugging file, is the basic building-block of the selector window in s-results. The output information after the user has selected the path to consider from the bad ones. The file is exactly like the results file, but without information about the position of this cell. The fields are, in order: speed-if-straight, average-speed, length-of-cell, number-of-steps.